I didn’t quite understand til recently that the terms of relationships are not always the same as what I thought as a little girl. 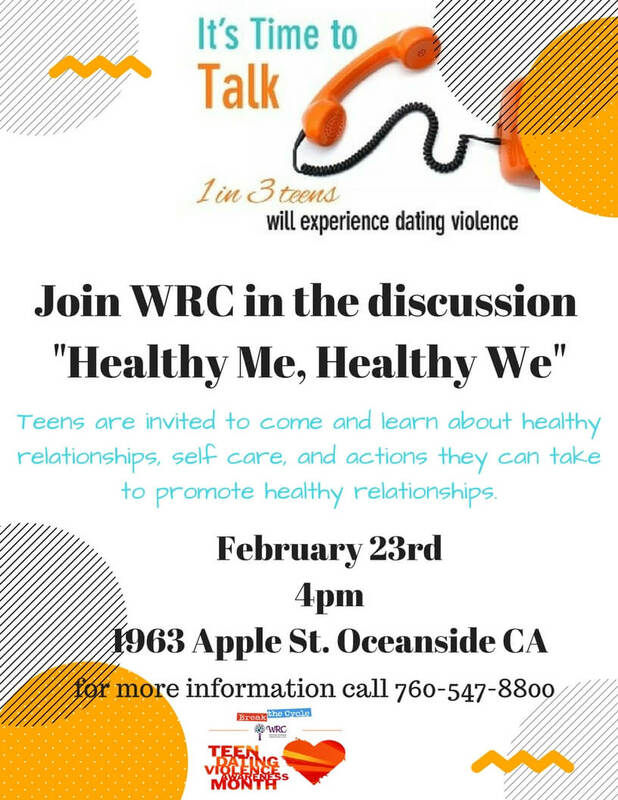 WRC will be hosting a discussion for Teens during Teen Dating Violence Awareness Month. As part of the discussion WRC Staff will take the time to go over what a healthy relationship looks like, how to set boundaries, and safety planning. 1 in 3 teens will experience some form of dating violence and the goal of the conversation is to help them see the warning signs and provide them with the tools to get help. In order to have a healthy relationship with others we need to have a healthy relationship with ourselves. The second part of the conversation will focus on being our best selves. How do we keep our mind and body healthy and ready to concur the obstacles in front of us. And finally, you have all this new knowledge what actions do you take? How do you help others? The only way to end dating violence is to make it unacceptable. WRC is looking for ways to engage teens in the work to end this violence and we encourage you to come with your ideas.